The genuine local experience a perfect place for travellers who love culture. Centrally located in historic Bangkok, Niras Bankoc is within walking distance of all major attractions like The Grand Palace, The Golden Mount, Wat Po, Wat Arun and even the night life in Khaosan Road. We provide a real escape from busy tourist traps but sit very close to the authentic soul of old town Bangkok, featuring world-famous food stalls and shopping. Experience a fusion of nostalgia and contemporary comfort when you stay in this newly renovated historic property, built over 100 years ago. Feel the charm of our historic setting while experiencing the genuine local way of life. Enjoy a warm welcome at our award-winning hostel. With a limited number of guests, we put more care into your stay, tailoring details for all guests and help them to enjoy the city even when travelling alone. 1. Double en suite: flat screen TV, DVD player, fridge; ABF (American Breakfast) included plus complimentary gourmet roasted coffee or tea. 2. Deluxe double sunroof (no side window but a clear roof over part of the room): TV, DVD player, fridge, teak sofa, shared bathroom; ABF not included. 3. Budget double standard (without window): a compact room (9x9 ft), shared bathroom and facilities in the common room; ABF not included. 4. 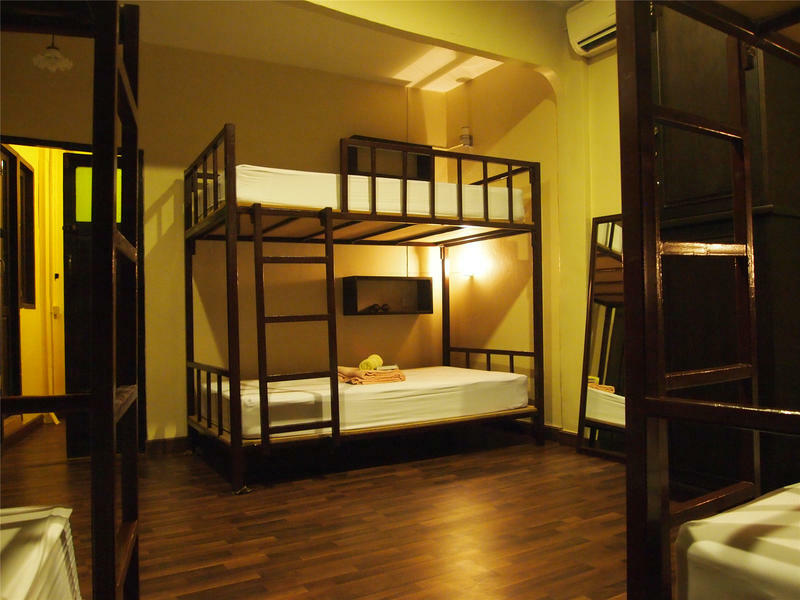 Mixed and female dorms: Comfortable four- or six-bed dorm featuring an extra large designer bunk and backpack locker, reading light, personal power point, shared bathroom and facilities in the common room; ABF not included. 1. Smoking is strictly not allowed in any area of the hostel. 2. No joiners or visitors allowed in the residential area except for the lobby. 3. Cash is in THB only; prepayment is requested at the time of checking in. 4. We encourage our guest to reuse linen and towels. 6. If your arrival will be delayed by more than three hours, please kindly inform us otherwise your bed will be re-opened. Please notify us by e-mail prior to your arrival, however, we have 24hrs security guard to welcome you. 9. This facility was designed to support security of foreign guests, be apologized for not accept Thai passport or ID card. 2. You may cancel your booking in written mail at least 5 days before arrival, without any charges. Less than 7 days notice - Full amount charge of every night during high season July, November,December, January. The trip to Niras Bankoc total will cost approximately 350 450 baht (include 2 steps of highway tolls about 45 baht, 25 baht accordingly) and take 25 - 40 min. depending on traffic. and ask taxi to call us 24hrs for direction.